Milch cows have worn bells for practical purposes for hundreds of years on small, hilly farms around the world, most notably in Switzerland where it is still called a trychel (also spelled trichel, treichel, treichle) The trychel was tradationally made of hammered sheet rather than cast metal to to make it lighter and easier to carry, wearning through fewer leather collars. The result is a less clean, clanking sound. In Germany, a similar version is known as the Almglocke. Dull and even noisy in a human hand, or among fans along the slopes of an Olympic skiing event, the melody is entrancing when several of them are carried by cows through a hilly summer pasture. The primary function, long since erased by commercial dairies where cows carry yellow tags in contained spaces, was to keep track of the herd. As was accurately portrayed in the film "Heidi," cows in the mountains of Switzerland, Italy, France and Germany were moved to high pastures where the sweet grasses grow only for a few weeks. With no fences to contain them in swerving alpine meadows, herdsmen often ventured for the day with a dog to remain with their cows. The bells allowed the herdsman to know how far off his cows had wandered without seeing them. It was found that predators were imtimidated by the pitched percussion sound. In New England, coyotes and bears associate them with people and tend to shy away from them. Here in the high meadows of Sandisfield, the bells have kept free roaming chickens relatively safe during the daylight hours. Bells are nearly always "on," even while a cow is lying down and chewing her cud, though the sound is a steady subtle sound. 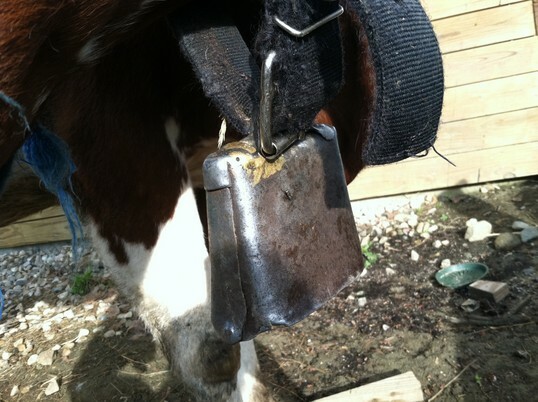 As a child in my mother's natie Germany and Switzerland, I fell in love with the sound of cowbells, and resolved to put them on my own cows one day. At age 12 I made a trip alone to a hardware store near Grinderwald and, in conversation in the German of my mother's northern family without the thick Swiss accent, conversed with the clerk. I told him I wanted the bells the farmers bought, not the tourist versions. He led me to a rear isle. I bought three brass bells in different sizes for their different sounds. I also collected 18th century bells made by early farmers in Massachusetts and Connecticut who forged them from whatever metal they could find over a hot forge, including one I found while tending a garden in Weston, Ct. which somehow had not rusted through. Utilitarian, its maker had taken a few extra minutes to punch a design in its round form. The early bells have a higher, melodic pitch. When a farmer had only a few precious bells, they were given to the "alpha" or lead cow. When cows are moved from one pasture to another, the herd will follow the alpha cow. Calves had their own smaller version. Adept at sneaking under fences and running through the woods, seemingly in a sense of adventure, calves in particular need bells. Hidden in tall grass much as a deer will hide her young fawn, they can seem to vanish. The bells are also uniquely useful for breeding purposes. Cows in heat will remain active at night, signalled by their bell, when they will attempt to "mount" one another. Called standing heat, it signals the onset of the 12-hour window of fertility in a 21-27 day cycle. Without monitoring, it can be missed. By night, I know each bell by its pitch and which cow is moving about and likely in heat. Daisy, Ruby, and Thyme all wear bells. One of them is from the hardware store in Grinderwald. Another is a 250-year old bell, its metal fashioned with melted brass by an early New England artisan. It is of the sort that would have been worn in the Berkshires by durham cows, cousins of the milking shorthorn breed. Why bells? people sometimes ask. On a warm, still, summer evening, take time to listen to the bells.